Montezuma cypress is a Southwestern native that really does well here. 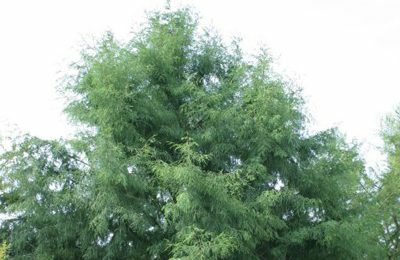 I like it because it holds its foliage longer into winter than other types of cypress. I like that fine textured leaf foliage that’s a completely different look than our other trees. Along the rivers of Central Texas, you’ll see the native cypresses that grow quite well. These are a good choice. If you get a seed source from this area, that’s a good one to use. The Eastern cypresses produce knees in our landscapes. Those in the swamps of Louisiana will grow here, but if it’s a little wet you get those knees coming up and that’s not really desirable. Montezuma’s a different species. Not only does it hold its foliage longer, it can take drought quite well. It can grow up to 60-100′ and 25-50′ in width.